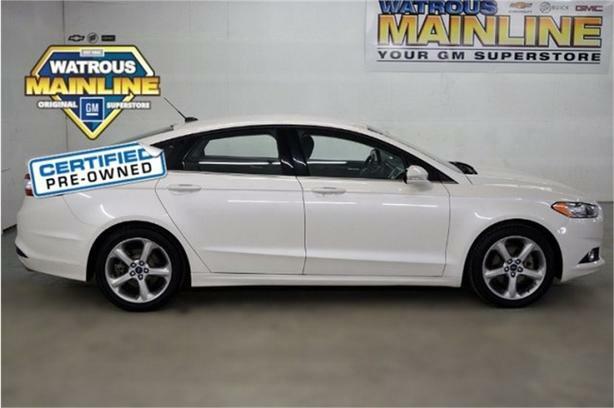 Check out this certified 2014 Ford Fusion SE. Its transmission and Regular Unleaded I-4 2.5 L/152 engine will keep you going. This Ford Fusion comes equipped with these options: Wheels: 17 Painted Alloy, Trunk Rear Cargo Access, Trip Computer, Transmission: 6 Speed Automatic w/SelectShift, Transmission w/Driver Selectable Mode and SelectShift Sequential Shift Control, Tires: P235/50R17 H-rated AS, Systems Monitor, SYNC w/MyFord -inc: Voice-activated communications and entertainment system w/911 Assist, SYNC Services, AppLink, Bluetooth, steering wheel controls, USB port and auxiliary input jack, Strut Front Suspension w/Coil Springs, and Streaming Audio. See it for yourself at Watrous Mainline Motor Products Ltd, 208 1st Avenue East Box 70, Watrous, SK S0K 4T0.